For the second year running world number one, Jason Day, has been recognised, with the Greg Norman Medal, as Australia’s best performing Tour Professional on the international stage. 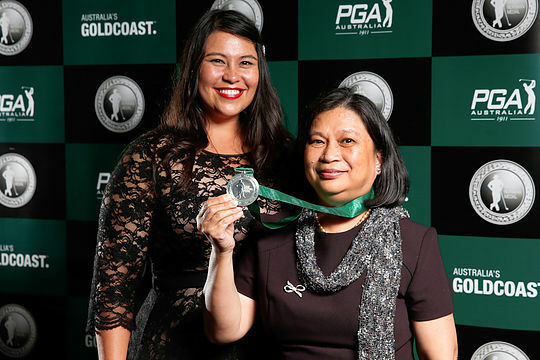 Complementing the pinnacle awards was the 2016 ISPS HANDA PGA Tour of Australasia Player of the Year, awarded to Adam Blyth, and the 2016 ALPG Player of the Year, which was awarded to Stacey Keating. Head Professionals at Charlestown Golf Club, husband and wife duo Ryan and Janelle Smith received the honour of being recognised as the 2016 PGA National Club Professional of the Year. Taking out the 2016 PGA National Teaching Professional of the Year award was Richard Woodhouse the renowned Director of Instruction at the recently opened KDV-Sport Academy of Golf in Queensland, where he works successfully with both amateur golfers and Tournament Professionals. After winning his first Queensland Teaching Professional of the Year award in 2013, Woodhouse also received the honour in 2015.